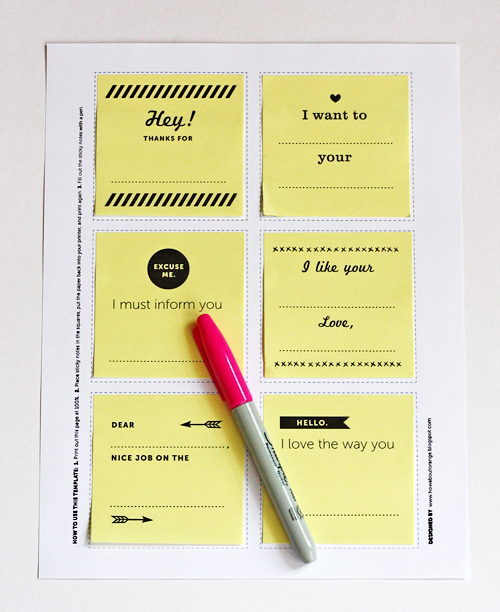 Surprise somebody with messages left in drawers, stuck on mirrors, or hidden in suitcases with this printable template. 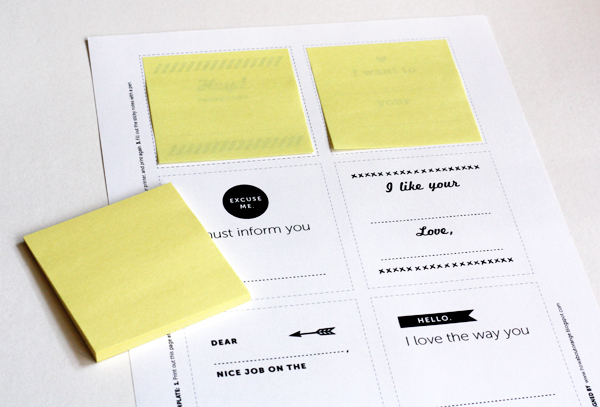 You can print the page on colored paper and cut out the notes, or get fancy and turn these into custom Post-it notes. Click to download the free template. 1. Print the PDF on regular paper at 100% size. 2. Place a sticky note in each square and press it down firmly. Make sure corners are lying flat. 3. Put the paper back into your printer* and print the file one more time. *ONLY TRY THIS if you understand how paper is fed through your printer. The top edge of the notes (where the adhesive is) should be pulled through the printer first or you're asking for a paper jam. Fill in the blanks and leave notes throughout your house. This? Is genius! Off to try this now. Thanks for creating this printable! The Standards and Practices board required it. In other words: My mom reads this blog. I love it! Wanna do it. :D but the blacked one are pretty intriguing :P.
These are cool! Great idea! Perhaps you could run a competition to see if we can guess what we can't see. I guess your mother would probably win. AMAZING! The perfect template to leave little notes for all my loved ones tomorrow! It's actually "kiss your little toes". You are so incredibly creative. thank you for sharing this with us! Love this, thanks for sharing! What a fun little way to brighten someone's day! So great! Thanks for sharing! These are awesome! I just printed them and they worked so well! Now I want custom notes for everything. This is SUCH a great idea! I've never thought of printing on a post-it before. I just printed a set and they are adorable. Thank you for making these! This is one of the coolest things I've ever seen. Thank you so much for sharing! super, werde ich nachmachen. Danke für das download! These are amazing! Such a great idea. I do fear that I will now fill my house with custom post-its though. I love it. Thanks for this post. Thank-you thank-you for this printable! It's such a snazzy design and clever wording. I just printed off some & stuck them all around the house -can't wait till hubby finds them! How fun are these! Great idea. Thanks for sharing the printable! Oh, this is genius! I work in the film industry where we are always looking for new and ingenious ways to customize things. I think we'll try this one right away! Luv this! I want to get back to putting notes in my kids' lunch boxes and this idea will help make it fun and unique! Thanks! Thanky you this is so great!!!! Love these - reminded me of notes i used to print, just that these are way cooler. Sticking these around my colleagues desk as a perk me up! Thanks! What a very clever idea, will have to give that a go. Love it! Printed them out, looks beautiful! arj;talejr these are fantastic! If I liked the people in my office more I would leave them prettier notes. As it is I might just print off a bunch and keep them for my own, nefarious purposes. What a super cute and brilliant idea! I need to try this! Love this!!! 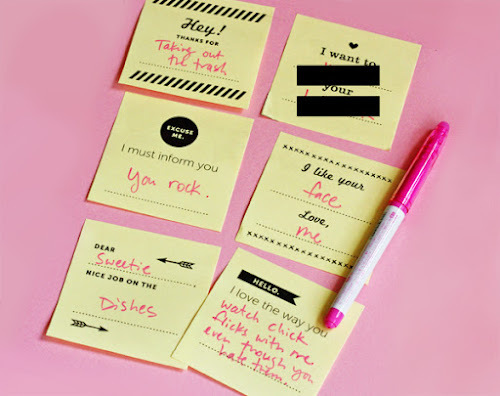 Do you happen to have a blank template I could use to create my own personal sticky notes? 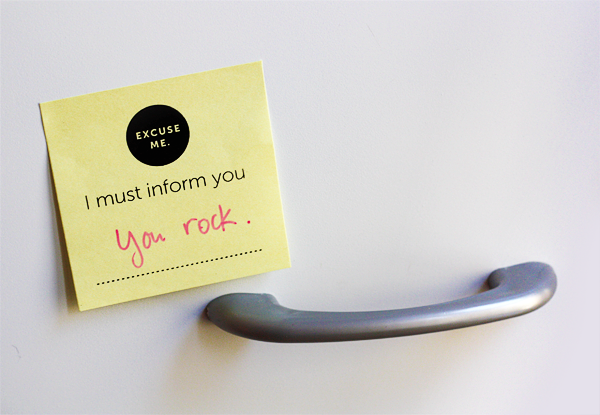 It would be a cool way to create little love notes for my kids' lunch boxes. Thanks so much!!! Love all your printables!!!! I made this template in Adobe Illustrator, but you can make your own in any software that will draw boxes. Just measure a post-it and draw squares in your file that are a wee bit larger, and then put whatever you want inside the squares. These are great! Thanks so much. I love these and will be using them all the time! Hi Edwin, unfortunately licensing agreements don't allow me to share the fonts, so even if I made the Illustrator file available, it wouldn't look the same on your computer because the type would default to something else. But you could make your own version in Word or Powerpoint, I bet, if you don't feel comfortable in Illustrator. Doctored a pad for a friend. Going to leave it on her desk for 2moro. She'll love it. Oh, these are amazing. Please create one appropriate for the work environment...trying to spread some positive vibe in our workplace.